As a slightly obsessed dog-mom who has been preparing her younger brother for his first experience in dog ownership, I have spent the past few weeks compiling a puppy starter pack list. Although plenty of pet stores offer their version of the new puppy parent gift pack, I just couldn’t find one that wasn’t packed full of “filler”, so I decided to compile my own using my years of dog ownership as a reference point. Pick a puppy collar that fits your new dog with two fingers width of space. Any tighter and your puppy will be uncomfortable; any looser and your dog can slip loose. Here's Samantha's explanation on how to fit a collar. Choose a puppy leash that you can comfortably hold and use to control your pup. We prefer the “traffic leashes” that have a main handle as well as a handle closer to your dog’s collar so that you can maintain control in situations that demand it, but there are other types that you may like better – here are some tips on choosing the right one. You can pick up an identity tag at most pet stores and they’re a MUST, whether you're a new dog owner or a veteran still without one. Make sure that your puppy’s ID tag includes their name on one side and your address and phone number on the other. Losing a dog is one of the worst nightmares, and the risks are always greater with younger puppies and dogs who are just getting accustomed to their new home. This isn’t something you can do yourself, but it’s something you have to arrange with your vet and it’s something you need to get done as soon as you adopt your new puppy. Similar to ID tags, a microchip is essential, experts say. Once you have the microchip placed, you also need to make sure to register it online with your current contact information and your dog’s identifying information. Pet insurance is not essential if you can start your own pet budget, but for many pet owners it's more convenient. It's an investment you have to make for the lifetime of your dog from puppyhood through to their senior years. There are multiple pet insurance companies to choose from and the best one for you will depend on which one your vet accepts, your monthly budget, and any anticipated healthcare needs. There are other factors to consider as well, so I recommend looking at this chart to answer some of these questions for yourself. Depending on the age of your puppy, you need to have the number of a dog training school or a dog trainer on hand. Do your research ahead of time to make sure that you find a trainer that you are comfortable with and whose services you can afford. For example, someone who doesn't use shock collars for training dogs, or doesn't use any negative punishment (some trainers still do, despite all the risks). After you adopt a new puppy, you won’t need the services of a trainer for a while (and maybe ever, if you're lucky), but it’s always good to start getting references for a trainer or obedience school ahead of time. You can also start your own education in dog training if you'd rather train the puppy by yourself. Another obvious one on the list. I recommend you stick with stainless steel food and water bowls. Porcelain, ceramic, or plastic bowls are porous and can contribute to bacteria growth and have also been known to contribute to “puppy acne”. You won’t need to invest in an elevated feeder just yet, but you may want to buy a feeder that will adjust with your dog throughout their lifetime. If you do this, make sure to keep the feeder on a low elevation so that your puppy does not strain their neck. However, there's some controversy behind these, and they may or may not be a good choice. There are a lot of dog beds to choose from and the type of puppy bed you pick is up to you. I personally recommend investing in a bed that is easily washable or that is waterproof, so puppy accidents are easily cleaned. You may also want to look into a chew proof bed if you expect your dog to chew through his first one (very likely to happen). In general, it's best to invest in a high quality USA made bed that will last years; majority of cheap ones flatten within weeks/months and are no good for anything. Crating is a somewhat controversial topic because some dog owners swear by it and others are completely against it. But the experts, trainers and vets agree that crates are very beneficial. The concept behind dog crating is to provide a safe and secure den that your puppy can call their own. It provides them a place they can retreat to when feeling overwhelmed but it’s also a means of keeping your puppy safe when you aren’t home to watch them. Choose a quality dog crate that your puppy can comfortably stand up in. It’s okay to pick a crate that is tall enough to accommodate your puppy when they are full-grown. To ensure that the crate you choose provides a safe place for your puppy, however, you must pick a length that only just allows your dog to turn around. The best way to do this is to purchase a puppy crate that comes with a divider so that you can adjust the crate size to fit your puppy as they grow. No dog should be kept in a crate for an extended period; this is cruel and unfair. A dog crate, when used properly, will keep your puppy out of trouble while you’re not home. If you're unsure of how to choose the right one and particularly the correct size of dog crate, see these tips first. If you're not getting a dog crate for your pup, then you don’t have to invest in a crate pad since you won't have where to use it. But if you choose to get either a soft crate or a metal dog crate, then it's recommend to invest into a crate pad or at least get some blankets to pad the bottom of your puppy’s crate. I prefer easily washable crate pads because curious puppies can chew blankets and get themselves into trouble. Depending on how you decide to work with your new pooch on puppy training, you may want to invest in puppy pee pads to help with housetraining. In our family we aren’t big fans of puppy pad training because it can cause confusion for your puppy by adding an extra step rather than going straight to training your puppy to go to the bathroom outside. However, many other dog owners and experts swear by it, so it's up to you. If you do decide to add that extra step into puppy housetraining though, grab a few packs of puppy pee pads before your puppy comes home (you'll need them soon enough). You need a vet not only to keep your puppy up to date on their vaccinations and annual exams but in case your puppy gets themselves into trouble. Young pups who are still exploring the world without any caution and are getting accustomed to their new surroundings are most likely to get themselves hurt. Keep your vet’s number on your fridge so you have access to it at all times. You will undoubtedly want to bathe your puppy, so you need to invest in a puppy-safe shampoo. Don’t use human shampoo, because it will dry out your puppy’s skin and throw off the pH balance. Additionally, some dog shampoos are better for puppies or adult dogs, so make sure to get the right type based on pH balance (here's a vet's guide on this). From personal experience I can also tell you that it's a good idea to buy a non-slip bath mat to line the bottom of your bathtub. This will make bathing your puppy so much easier because it means that they won’t be slipping and sliding all over the tub while you’re trying to hold them still and scrub them clean. I recommend going with a long mat that will cover the entirety of the tub bottom and one that has mildew and mold protection. Dog nail clippers are another must-have sometime after you bring your new puppy home because you'll likely have to clip his nails in a few weeks. Even though your puppy won’t need their nails clipping right away, but if you intend on cutting their nails yourself instead of going to a groomer, then you want to get them used to seeing and being touched by the clippers as soon as possible (even if you're not cutting anything). A dog toothbrush and toothpaste is another must. You will have to brush your dog’s teeth regularly and the sooner you get your puppy used to having a toothbrush in their mouth, the better. It's much more difficult to get your dog agree to brushing his teeth when he's older. Your puppy will need something safe to chew on while they are teething. There are plenty of teething puppy toys to choose from but I recommend picking a freezable toy that will keep swelling down and moderate pain. Don’t spend too much time investing in those plush dog toys; grab one or two for comfort but know that they will more than likely end up shredded so make sure they are puppy safe (not all dog toys are good for young puppies). Easily forgotten but exceptionally important, invest in waste bags and get plenty of them. I recommend going with environmentally-friendly biodegradable dog poop bags with handles. They make pickup easy and don’t contribute to environmental pollution. Many will be scented, have their own holder and other features. Your puppy will not need monthly preventatives such as from heartworm and fleas until they are slightly older (this depends on your puppy’s current weight and age when you bring him home), but you need to have these on hand when your puppy needs to start taking them. Preventatives are a necessity for keeping your puppy healthy long into their senior years. Chances are that you won’t need a first aid kit when you first bring your puppy home, but you should always be prepared. Sometimes every minute will count. You can build your own dog first aid kit by including essential items there, but there are plenty of pre-assembled pet first aid kits too. Personally, I like the Adventure Medical Kits Adventure Dog Series Workin' Dog kit the most because it covers all the bases. Dog food is a no-brainer, but make sure that you buy a bag of the same food your puppy has been eating before they came home with you. Even if you plan on switching your dog’s food later, it’s important to make this transition slowly to avoid stomach upset. Do your research on the best puppy food brands and pick the right type for your puppy's breed, current age, activity levels and other factors. Adult dog foods cannot be fed to puppies and vice versa. You will want to limit treats for your new puppy because they are high in calories and can be exceptionally rich leading to an upset tummy. Give dog treats to your pup sparingly and stick with natural and healthy options if you can. Nevertheless, it's good to have some low-calorie ones on hand for later once you start training your new pup. If you plan to drive around with your puppy in a car (and most would), then you'll need to secure him properly. While all dogs must be kept safely in vehicles, this is particularly true for puppies who are smaller and less accustomed to car travel. Some states even require this by law. Most dog car seats aren't safe, according to studies. A crash tested safety harness is a better choice if you are not containing your dog in a crate while traveling in the car. 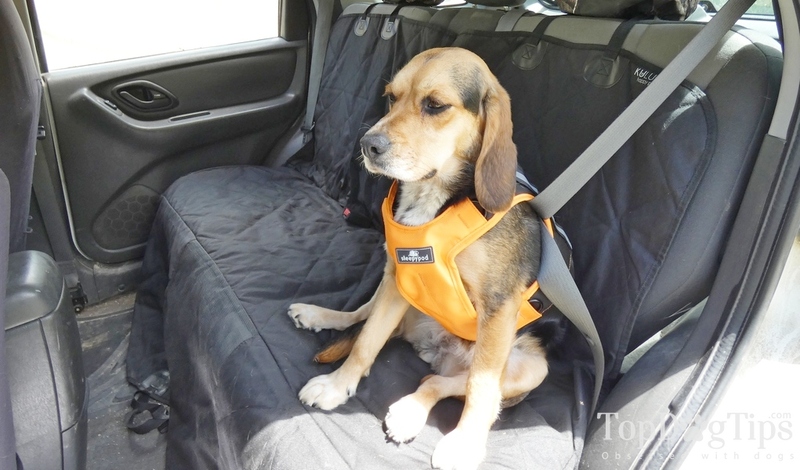 There are only three car harnesses that have passed the crash tests from Center for Pet Safety, and you can find more details here. But overall, most experts recommend the Sleepypod Clickit Terrain Safety Harness (Samantha did a test and review here). A baby gate or a puppy pen is a necessity for keeping areas of your home off limits for the puppy. If you have a baby pens, you can use those to contain your pup while you’re home but distracted with making dinner. Use a pet gate to keep stairways or outside doors off limits. Containment is important in larger houses when there's risk of your pup getting injured or otherwise finding trouble. Your puppy needs grooming with a brush to keep long hair from tangling and to stimulate their skin to produce healthy oils. Grooming is also a good opportunity to bond with your puppy which is why I prefer the grooming glove (although if your pup has long hair you’ll need a brush in addition to the grooming glove). Finally, it's something that you yourself need after you bring home a new puppy. A carpet cleaning brush and a bottle of pet odor removers like the Nature’s Miracle is a must when you’re house-training your puppy. Accidents will happen and you want to thoroughly clean them when they do to prevent them from happening again in the same place. If you’re really house-proud, we suggest investing in a pet vacuum that's kind of a portable carpet cleaner. There are a few options to choose from and they're not that expensive, but my favorite is the affordable Bissell SpotClean which was the best option from the three that I've tried. When it comes to shopping for your new puppy supplies, the biggest piece of advice I can offer any new pet parent is not to overdo it. Just like human parenthood, most new pet parents buy far more than they need and wind up wasting money. You can always purchase additional items as you need them, so stick with the basics to begin with and go from there.